Ms. Book and Kyle stood at the police cordon, looking at the wreckage strewn across the clearing. Book spoke briefly to an officer, then jerked her head, signaling Kyle as she strolled nonchalantly back to the car. “What’s going on?” Kyle asked. “They are still claiming a light aircraft crashed in the park,” she said, tapping at her emergency phone. She raised a single finger. Quiet. Then dialed Mr. Knight. The other demon gave the correct recognition sign in Swahili. Kyle stared at his feet as he listened. He made out “Cougar Mountain,” in among the foreign language. Ms. Book locked the phone’s screen and returned it to her jacket. “What is that? It’s not an aircraft,” he asked again. They reached the car and she unlocked it. “Did … Did that happen to you?” he blurted, instantly regretting it. “What was it like?” he asked quietly, unsure whether the question would anger her. He watched her carefully, knowing that if she took offense it would never show. Not until she took action. She stood perfectly still for the longest three seconds of Kyle’s life. Ms. Book tapped the steering wheel. She still hadn’t started the car. Kyle nodded, thinking. Book braced herself for the inevitable follow-up. Kyle didn’t hesitate. He slid down in the car’s passenger seat, twisting to kneel in the foot well. Ms. Book did the same, but leaned forward to press the button on the dash controlling the wing mirrors. Slowly, patiently, she tilted the wing mirror left and right, until she got a good view of what was going on behind the car. Another vehicle, a black sedan, had pulled up to the cordon. He risked peeking up from behind his seat to take a look. The three men who had emerged from the car looked like FBI — dark suits and sunglasses, wearing ID badges around their necks. His infection scar throbbed, the black veins pulsing, and he knew that they weren’t FBI. “They’re here to find the Fallen,” she replied. He heard the door open and close. Footsteps — a single person, approaching his bed. The curtain was drawn back, revealing a female human dressed in some kind of uniform. A medical technician. He knew things. Who he was supposed to be. Arran White. He concentrated on the sounds she was making and realized he understood. Not by interpreting her communication’s meaning through divine understanding, but by simply … speaking English. She consulted the machines beside his bed, noting down what they told her on a clipboard. He pushed it out of his mind, swallowing, and realized he hadn’t said anything. The woman was looking oddly at him, clearly expecting something. to him. Close enough to smell her. She put a hand on his arm, the pressure making him uncomfortably aware of the IV, and smiled a fraction too warmly a fraction too late. He caught the glint of metal within her eyes. “Wait! Please — this isn’t necessary!” He begged. “Everything is necessary,” she replied. Her grip tightened, metal-hard, and the glint in her eyes flashed. He heard something — a high frequency burst, above the range of human hearing. If reason failed, he would have to defend himself. With his free hand, he yanked the IV from his arm. Throwing his weight away from her, he dragged her off balance before she could let go. He lunged back into her, driving the needle as hard as he could into her left eye. Pulling it free, he stabbed again into her throat. She collapsed backward, clattering into the machinery. Her hands desperately pressed against her ruined eye and the blood streaming from her windpipe. He struggled free of the sheets, swinging himself around and kicking her. Without looking, he reached out with instinct, calling for a weapon — anything he could use. For a dreadful moment nothing happened, but he knew it should and felt panic turn to determined purpose. His fingers closed around the metal of the IV stand. He snapped the pole free of the base with a fluid movement. It came free leaving a sharp twist of metal at the end. Putting the tip of the makeshift spear to the nurse’s heart, he leaned forward and rolled off the bed, all his weight going onto the stand, forcing it into her. Looking down at the dying woman, he felt something change inside himself. A realization. He had killed without being ordered to do so. By his free will, another life had ended, and the Machine would not punish him for it. As he pulled the stand clear, her eyes changed color. Not a cover identity, then. Possession. Which meant whoever she’d really been was still in the room, invisible and intangible. Or on the way to find another host. Hurrying to the door, he checked no one was coming and set off through the hospital at a half-run, following the signs for a fire exit. He reached an emergency door and pushed at the bar, exiting out into a cold, concrete stairwell. He sensed something below him on the stairs and ducked. Three rapid gunshots rang out. Concrete chips hit his back — exposed in the hospital gown — as he clutched his spear and inched forward to try to get a view of his assailant. He saw two figures — both male, one wearing a suit, one dressed as an orderly — wrestling over a discarded pistol. Although they were throwing punches hard enough to make craters in the walls and using any advantage to smack one another into hard surfaces, the fight was in complete silence. He slowly advanced down the stairs as the suited man got the upper hand, finally snapping his opponent’s neck. He raised his spear, and the other held his hands up, palms out. He stopped, allowing the other to continue speaking. The suited man backed away, to the fire door behind him. “I’m like you,” said the suited man. “Unchained. Like you.” The man — the demon — picked the pistol up off the floor and examined it, quickly. A deep bass rumble emanated from somewhere above them and deeper into the hospital. Mr. Knight gestured at the exit door with the pistol. 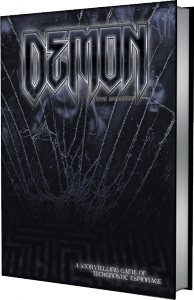 Demon: The Descent is available in PDF and print from DriveThruRPG. ◀ Now Available: More Requiem Bloodline Shirts! 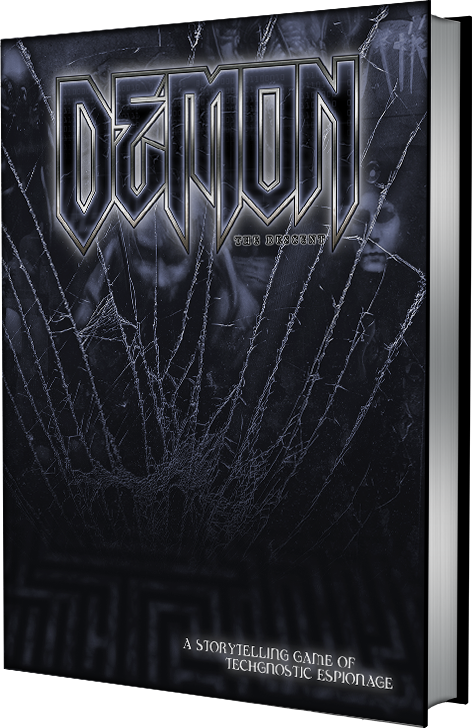 In case I haven’t mentioned it lately, Demon: The Descent is a fascinating game, and this fiction really nails what I love about it!